DONEGALDAILY.COM welcomes personal tributes to recently deceased loved ones and friends. 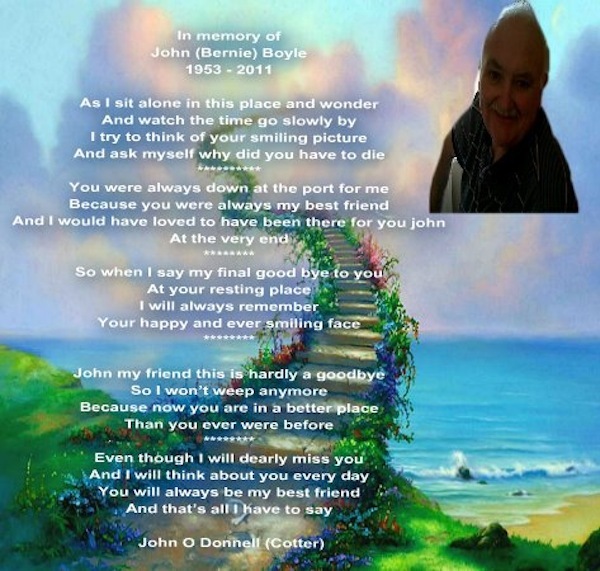 John O’Donnell has asked us to include this tribute to his friend John ‘Bernie’ Boyle. Mr Boyle, of Burtonport, passed away at the hospice on Saturday. Burtonport. His Funeral Mass is on Tuesday at 11am in St Columba’s Church, Acres with burial afterwards in Belcruit Cemetery.